Leaking ducts are costing you more than you think. Something most of us never even think about could be costing you a lot more than you bargained for. Whether your home is old or new, you are prone to leaky air ducts. And that puts extra stress on your HVAC system - not to mention your wallet. Leaks contribute to safety issues relating to backdrafting of gas appliance fumes, auto exhaust and radon gas into your living space. If so, you probably have leaky air ducts. But now there's a solution. Aeroseal® Duct Sealing is a patented breakthrough technology that tackles leaks from the inside out. Developed in the 1990s at U.C. Berkeley with funding from the United States Department of Energy, Environmental Protection Agency, California Institute for Energy declared Aeroseal as one of the most beneficial energy technologies for American consumers. You can see a water leak, but an air leak is invisible. Duct leaks can be difficult and costly to find with ductwork hidden between the walls, floors and ceilings of your home. The older, traditional use of mastic (a messy caulk-like substance) or taping of leaks not only is less effective than Aeroseal, but also can be very labor-intensive and expensive. Other substances break down over time, but the Aeroseal sealant does not and even has a 10 year warranty to back it up. Do-it-yourselfers might attempt their own fixes, but what about those ducts you or your HVAC specialist can't see or access? Let Aeroseal handle the entire job and you won't be tearing up your home or worried about incomplete seals. Aeroseal pinpoints and covers leaks, in roughly an hour, from the inside out with a success rate of up to 98%. 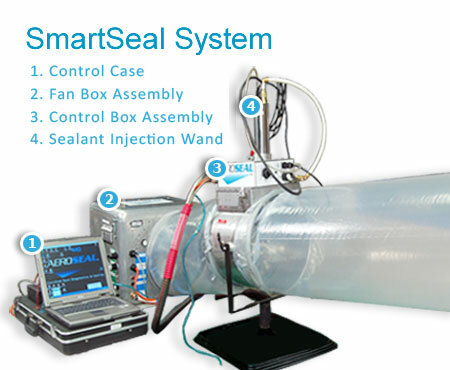 Aeroseal is the most effective, affordable, and viable method of sealing air duct leaks on the market. Aeroseal software allows your technician to accurately measure the duct leakage in your home. The Aeroseal process puts excaping air under pressure and causes polymer particles to stick first to the edges of a leak, then to each other until the leak is closed. Contact us today at (805) 692-4980 and we will be happy to investigate and locate the hidden problem areas in your ducts. We'll properly diagnose your system, providing you with a cost-effective, state-of-the-art solution to your duct issues.